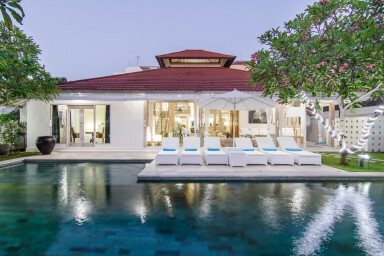 This breathtaking three-bedroom villa in the centre of Seminyak is only a few minutes’ walk from the wide sandy Double Six beach, as well as some the best shopping and dining Bali has to offer. The white theme (or ‘putih’ in Indonesian) combined with its impressive use of space give Villa Putih a very bright and modern feel. Built in traditional Joglo-style, the villa’s semi-open architecture allows for plenty of natural air flow and coolness, while the cathedral-like living and dining area is a real showstopper. Looking up at the ceiling from one the comfortable big sofas gives you a good idea of just how awesome this space is. Included in this rental are three large king-size bedrooms. Each comes with air conditioning and very stylish semi-outdoor ensuite bathrooms, one of which has its own massage table. Like the rest of the villa, the bedrooms have been tastefully decorated with furniture made from reclaimed material. There’s also a fourth bedroom on the mezzanine level which can be rented at an additional cost. Although it has a comfortable king-size bed, this bedroom doesn’t come with an ensuite bathroom. The stunning tropical garden has a meticulously kept lawn and a large private pool. With its wooden deck and sunbeds, this is a great spot for catching the afternoon sun or enjoying a freshly made cocktail. Villa Putih has a large kitchen with all mod cons and is perfect if you like cooking. We’d very much recommend you let our private chef take care of the cooking instead, so you can focus on fully enjoying your holiday. At an additional cost she’ll prepare you the most delicious daily breakfasts, lunches and/or dinners. She’ll also gladly throw in a little masterclass in Indonesian cooking – perfect if you want to impress the crowd back home. Great last minute booking, super efficient host. The villa was super large and clean. Could not be happier. Awesome place for our friends trip. Would be perfect for family too. It was a clean spacious villa reasonably well located in Seminyak. Bali is a nightmare to travel around due to the traffic and I would suggest to only stay 3-5 days in Seminyak and move to another spot in Bali for a new experience.If you stay here use the beach route to get around vs. the street. However, the villa was fully open to the elements (open living room onto the pool and yard) and had no bi-fold doors (surprising!) to close you in at night. This was not comfortable for my party who felt a little insecure, even though night time security was provided. I would recommend that this is rectified with glass doors installed to provide more security or at least peace of mind. Additionally the bathrooms are not fully sealed which might be to some liking for me this again is a negative factor which reduces security and lets the not insignificant insect life directly into the Villa. We had a great time at Villa Putih -the rooms and grounds are very nice and the location is unbeatable. We had a great stay. The villa is beautiful with everything you need for a comfortable stay. The staff was very helpful and friendly seeing promptly to our every need. We had breakfast made every morning and a chef for one amazing Balinese dinner. The Villa is also centrally located with easy access to the beach, shops and restaurants. Truly amazing!